The original Ribbon range was introduced several years ago, offering simple stylish seating in many different forms, and all at very affordable prices. Following its popularity since, the range has now been expanded to include XL versions of the products, with an even wider choice of options. The principle of both the original Ribbon and the XL versions is the same - a minimal number of seat support components and timber section profiles that can be combined to give many different bench and seat assembly types. 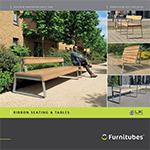 Simply changing the timber slat lengths means a wide range of coordinated seating products can be used on a single scheme, from single seaters up to four-person units. Ribbon and Ribbon XL offers the specifier coordinated designs suitable for a variety of schemes, appropriately styled for prestigious new developments yet economic enough for ‘everyday’ sites. In addition to conventional seating configurations, Ribbon also offers the unusual form of the ‘Multiseat’ - which can be used as two-tier seating or a seat and table surface - and the new Ribbon XL recliner is a new high-back twin seat for more laid-back seating situations.